Indicator applet for displaying and changing CPU frequency on-the-fly. In installed where do I find it? Move it around using right-click and “Move”. but it seems to work anyway after adding it to the panel. Ubuntu Geek – You are a genius – I love you! My ppp-daemon kept dying after a few seconds of dialup apparently because of varying CPU frequency but now thanks to Carlos Garcia Campos I can set the speed (any speed except “On demand”) and my dialup works like a charm. I can’t find it anywhere in the add to panel lists. This is one of the most annoying things with Ubuntu installing something then never finding it on any menu. Is there a tool like this for memory usage? Very nice. Sorry, what exactly do I do after I get to “E: Couldn’t find package indicator-cpufreq”? Would somebody please walk me through this? I got it installed and everything, but it just has two options: performance and powersave. I want to be able to actually control the amount of GHz being used myself, this thing doesn’t allow me to do that. This tool works great on this laptop and is a replacement for the HP coolsense tool in windows. 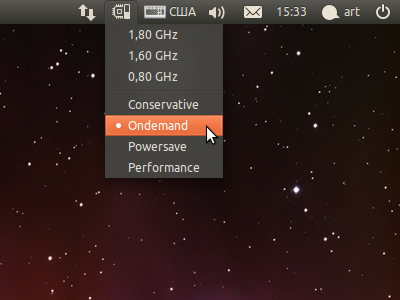 Tip: install TLP together with cpu-frequency-indicator. It saves battery power!